Train wash plants and control emission toilet (CET) systems, together with basic equipment for train depot facilities, have been developed by Aquafrisch to support the expansion of the railway industry. 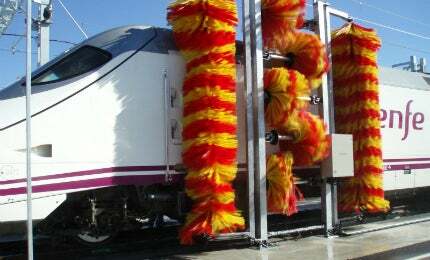 Train wash plants can be customised to attend specific needs in rolling stock. Aquafrisch is a service-oriented company. From the earliest stages of project design to after-sales maintenance services, Aquafrisch is focused on customer confidence. The company aims to generate the best value for customers by developing its own equipment and services, or working together with leading partner companies in international markets, across more than fifteen countries. Aquafrisch offers a wide range of equipment manufactured in its own factory. This is complemented by a distribution network with international commercial partners. This combination achieves a complete offer that includes high levels of quality and technological innovation while ensuring high-quality service standards. Train Wash Plants offer many possibilities for specialist equipment, including traffic indicators, train identification systems, motion-sensors, train driver information displays, touchscreen control-panel, speed control systems and monitoring options. All train wash plants can be tailored to customers’ needs, and designed together with water treatment systems. These include either recycling for environmental care so water can be reused, or demineralising processes such as osmosis and softeners for best rinsing results. CET systems were developed by Aquafrisch to make the removal of waste from train toilets an easy and safe cleaning process. The process can be used with either large fixed installations or single mobile units. Aquafrisch CET systems enable tailored solutions for tracks up to 500m long and multiple servicing points. The extracting and refilling process is designed with vacuum technology to ensure optimal working speed and a very low maintenance profile. Piping installations can be adapted to suit the space available and either built in stainless-steel or PVC materials. The system processes effluent, potable water, clean water and chemical products (including biocide) as necessary. CET systems are controlled with easy to use touch-screen control panels, allowing specific programmes for every type of train. The programme can be based on the number of toilets on the train, litres required for discharge-flushing-charge, and biocide mixture. Aquafrisch offers different solutions for bogie wash, including systems with or without cabin and different degrees of automation. Our washing system include oscillating piping engines for pressurized water spray, allowing uniform distribution on all parts of the equipment to be washed. Aquafrisch manufactures customised installations for washing internal rail tank wagons. Integration of new technologies with high quality components has permitted the development of an efficient washing process based on an extensible system of rotary heads, fed with hot and cold high water pressure (up to 200 bars). Aquafrisch is experienced in wastewater treatments and provides a wide range of solutions for train depot needs, from water recycling systems to high-proficiency wastewater treatment plants (including biocides), tailored to customer’s needs. Effluence Treatment plant: The use of biocides in train toilets, solvents for removing graffiti, tank cars, etc. make the treatment of water from the railway workshops a complex task that should combine different purifying processes to achieve the appropriate discharge parameters. Water recycling system: The system treatment allows the reuse of up to 80% of water used in the washing of railway vehicles. Reverse osmosis and Water softener: Many of the processes taking place at the workshops require good water quality to ensure optimum finishing (softening, demineralisation, reverse osmosis, MBR processes, etc.). Aquafrisch is proud to have a variety of train depot equipment available, including the sand system, rain test systems, lifting jacks and measuring devices for local market. In addition Aquafrisch has a great network of high-standard European partners, which allow it to offer a complete range of rail equipments to the market. Please use the form below to send Aquafrisch your business enquiry. Aquafrisch is to exhibit their products at the forthcoming Innotrans 2014 exhibition in Berlin, Germany.